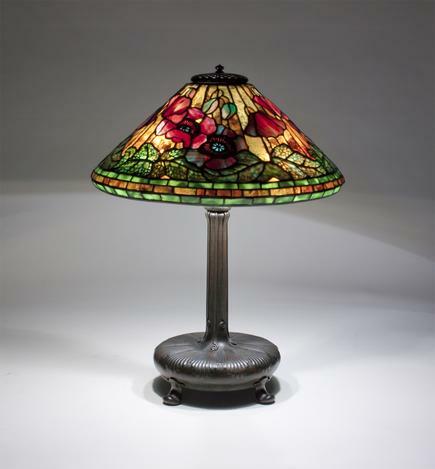 A Tiffany Studios leaded glass and bronze table lamp, comprising a 16” diameter Poppy shade, the scarlet-red poppy blossoms with golden and teal centers surmounted by pierced brass filigree, with delicate green and pink poppy buds along the upper edge of the shade, against a rich background of golden-amber “foliage” glass, the leaves along the lower edge of the shade articulated in green and amber mottled glass, with pierced brass filigree representing the veins of the leaves mounted to the interior of the shade adding to the naturalistic effect, on a bronze "Decorated Cushion" table base in rich brown-green patina. 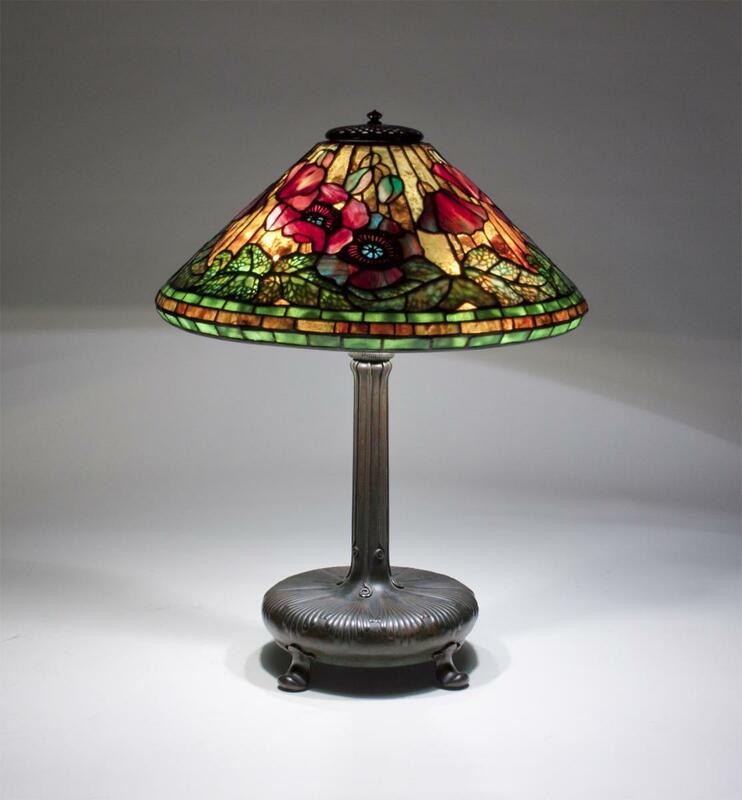 This original Tiffany lamp comes with a period reticulated heat cap in matching patina and is signed. 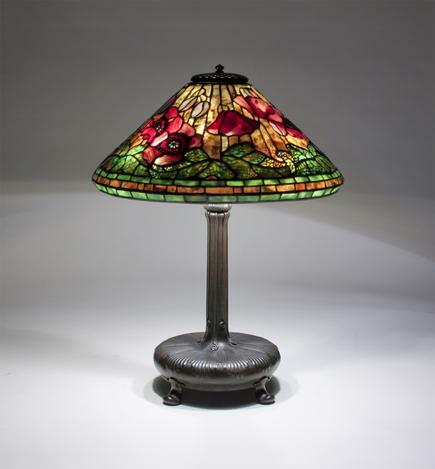 A Tiffany Studios leaded glass and bronze table lamp, comprising a 16” diameter Poppy shade, the scarlet-red poppy blossoms with golden and teal centers surmounted by pierced brass filigree, with delicate green and pink poppy buds along the upper edge of the shade, against a rich background of golden-amber “foliage” glass, the leaves along the lower edge of the shade articulated in green and amber mottled glass, with pierced brass filigree representing the veins of the leaves mounted to the interior of the shade adding to the naturalistic effect, on a bronze Decorated Cushion table base in rich brown-green patina.